Create your own opportunities, don’t wait for them—that was one of the messages suggested by Azure Antoinette’s keynote address during the 6th Annual Women and Leadership Alliance workshop held in February at the Athenaeum. Antoinette addressed an audience of 7-C students, staff, faculty, alumnae, and friends of the Colleges. 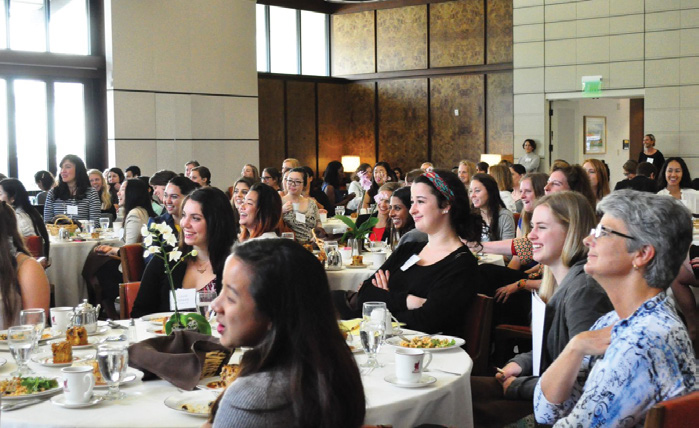 Sponsored by the Women and Leadership Alliance, the event featured a workshop bringing together more than 25 successful women leaders representing entrepreneurship, entertainment, education, public service, consulting, finance, health services, and marketing back to campus. More than 90 students from across the 7-Cs enjoyed the keynote presentation by Antoinette, who is CEO, Poet, and Millennial Advocate focused on Creativity, Courage and Using Voice to Initiate Action. The keynote presentation offered an inspiring introduction to the half-day workshop, which incorporated honest and open dialogue between students and female leaders in attendance. Throughout the afternoon, attendees participated in an informal roundtable discussion with table leaders split by industry, allowing students to ask questions focused on specific career and post-graduation experiences as well as on engaging one’s passions inside and outside the workplace. All participants were extremely receptive to the advice and open conversation, remarking that they enjoyed the opportunity to ask questions not heard in “typical” networking situations.